Screening details: A. Raja, Union communications &amp; IT minister. 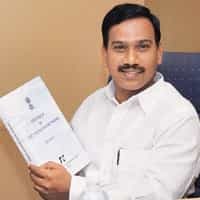 The department of telecommunications (DoT) will issue fresh guidelines for giving telecom licences to new applicants and additional spectrum to the existing telecom operators before 15 October, says Union minister for communications and information technology A. Raja. Screening details: A. Raja, Union communications & IT minister. “A committee has already been formed to scrutinize details of new applications and spectrum-related issues," he said on the sidelines of the International Telecom Summit, organized by industry lobbying group Assocham. The government has received around 300 applications from some 30 companies such as AT&T Inc. and real estate firm DLF Ltd.
With only about 20MHz of spectrum to be made available, existing operators, such as Idea Cellular Ltd and Vodafone Essar Ltd, are scrambling for more spectrum in order to roll out services across the country. India has around 241 million wireless subscribers and some seven-eight million new customers are being added every month, making it the fastest growing wireless market in the world. The problem, however, is the “network congestion and a worsening quality of service, which these subscribers, especially those in Mumbai and Delhi are facing", said Duncan Clark, chairman of BDA China Ltd, a Beijing-based research company. Any further delay in spectrum allocation would also affect India’s aim to have 500 million subscribers by 2010. “If the spectrum issues are not resolved, we may only have 361 million subscribers by then," added Clark. “Spectrum is a serious issue, you cannot be populist about it," said the chief executive of one of the operators who is waiting for more spectrum to expand its operations and did not want to be identified. “You need at least around Rs30,000 crore for setting up a pan-India network—it’s not a short-term play." The cellular operators association of India, the apex body for companies that offer telecom services using the so-called GSM networks, such as Bharti Airtel Ltd and Vodafone Essar, said priority should be given to those who already have licences and are waiting for additional spectrum. “Moreover, we have suggested a five-year lock-in period for any new operator for ensuring a long-term commitment," said T.V. Ramachandran, the association’s director general. Any further delay or ambiguity around spectrum allocation will also affect India’s ability to offer 3G services that allow faster downloads of rich media files such as music and video. “At current pace, we do not see 3G happening in the country anytime before end of 2008," said Clark.